Tasmanian Power Metallers Taberah have been gigging for a while now, and have crafted a solid, entertaining live show. However, in their six year life span the band haven’t committed much in the way of recordings. So how does the quintet hold up on their debut full length, The Light of Which I Dream? The album finds itself in an interesting position, full of ear-stomping, straightforward riffs, but certainly not without a few deviations to the norm. Thankfully, from the effects-laden vocals to finger-snapping beats, these elements fit in nicely with the band’s overall power metal vibe. The same can be said for the album intro and the few intervals that are scattered throughout the album. Including these, a band always runs the risk of ruining the flow of the album, however Taberah have ensured that these moments don’t overstay their welcome. As the album continues, the rock n’ roll influence becomes more apparent. 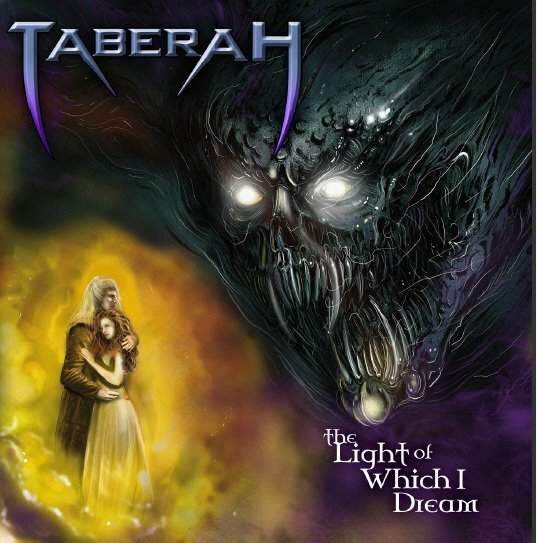 Whilst Taberah have done a good job of meshing their influences – which seem to run from The Darkness to Helloween – occasionally a lead will appear straight out of nowhere, and disappear just as quickly, clashing with the rest of what is going on. However, at other times it works great, as “Stormchild” bridging the sonic gap between Danger Danger and Saxon, with lyrics to match. This track is perhaps the highlight of the album, from an arena-worthy chorus, to a blistering solo. Is that a bird whistle? Perhaps the only weak song on the album comes in the form of a ballad, “The Ballad of Ruby Joy”. The song starts out decent enough, and wears its Queen influence on its sleeve, but doesn’t have enough going on to warrant its length. All is not lost, however, as the track very nicely segues into the album’s title track, which seems to sum up all the strong elements of the album. But the band isn’t finished yet, and the final two tracks – the epics “Requiem Of The Damned” and “The Reaper” take us out nicely. The Light of Which I Dream is a phenomenal effort for a band of such young musicians. Solid playing on behalf of all the members has ensured everyone knows exactly what the band is about, and frontman Jono Barwick’s vocals sound like the happy medium between metal master and humble pub rocker. Thanks to the fun quirks and lyrical subjects that range from battles to broads, the album does too. It isn’t uncommon for a band to take on a number of styles, place them side by side and call it a day, but Taberah have gone a step further, and created something wholly original. This entry was posted on October 27, 2011 at 4:35 pm and is filed under Records. You can follow any responses to this entry through the RSS 2.0 feed. You can leave a response, or trackback from your own site.